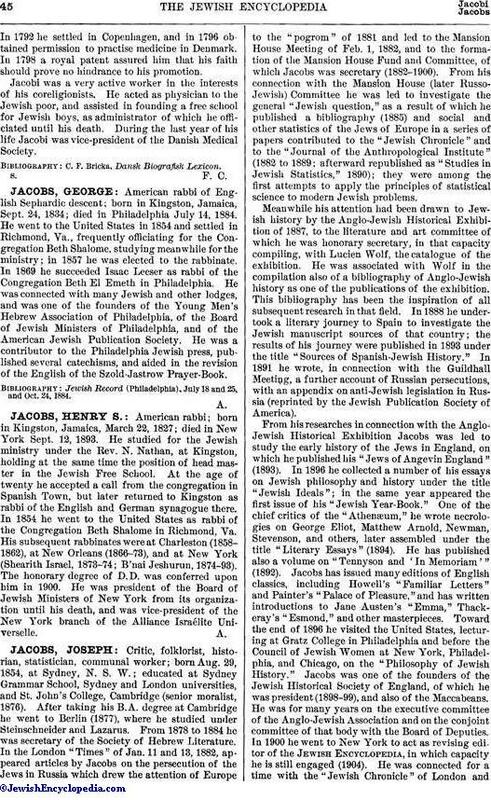 American rabbi; born in Kingston, Jamaica, March 22, 1827; died in New York Sept. 12, 1893. He studied for the Jewish ministry under the Rev. N. Nathan, at Kingston, holding at the same time the position of head master in the Jewish Free School. At the age of twenty he accepted a call from the congregation in Spanish Town, but later returned to Kingston as rabbi of the English and German synagogue there. In 1854 he went to the United States as rabbi of the Congregation Beth Shalome in Richmond, Va. His subsequent rabbinates were at Charleston (1858-1862), at New Orleans (1866-73), and at New York (Shearith Israel, 1873-74; B'nai Jeshurun, 1874-93). The honorary degree of D.D. was conferred upon him in 1900. He was president of the Board of Jewish Ministers of New York from its organization until his death, and was vice-president of the New York branch of the Alliance Israélite Universelle.